Ranging from sassy to fierce, our womens gothic footwear embraces a wide array of styles to ensure that you can find the look you need to complete your gothic ensemble. Available in many different shoes types, our gothic high heels include stilettos, pumps, platforms, wedges, and more. 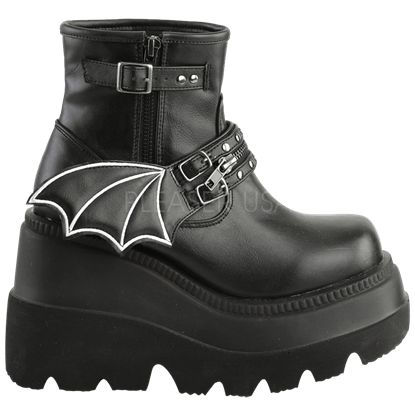 Our womens gothic boots feature combat boots, go-go boots, knee high boots, ankle boots, and other designs. Our gothic flats range from ballet flats to Mary Janes, rounding out our selection. Certain designs display details like studs, spikes, chains, blood spatter, and skulls, while others showcase lace, buttons, and rhinestones so you can be sure to find something of interest for daily wear, formal occasions, or parties. Make us your first stop when you need a stunning pair of ladies gothic shoes. 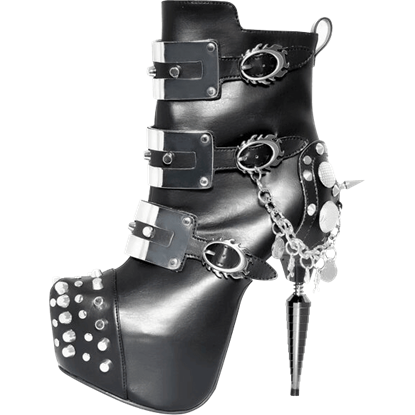 It is a fact that every womans Gothic wardrobe needs a pair of shoes that go the extra mile. These Athena Gothic Heel Boots feature modern Gothic styling with accents that will set your outfit over the top in the best way possible. Gorgeously detailed with intricate metallic embroidery, the Azure Embroidery Platform Heels are truly dazzling. These bold shoes pair their elegant pattern with an edgy metal heel for a fashion goth look that is absolutely glam. You should not have to express just one facet of your multidimensional self at the expense of the others. 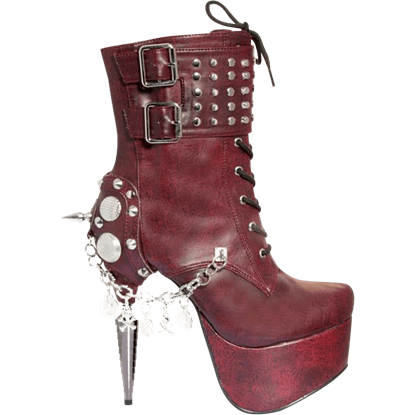 Maintain your Gothic style, sport your spunky side, and even boost your height all in one with the Batwing Ankle Boots. How do you spot a witch? You usually look for pointy shoes. Although once you catch sight of these Bewitching Black Pumps, a bit of witchy style will hardly seem like a bad thing. In fact, these shoes make it seem like a very good thing. Give your confidence and height a boost with the help of these amazing womens boots! The Black Knee High Stiletto Boots feature a 4.25-inch heel and lace up the front through hook and eye fastenings for a stunning look. 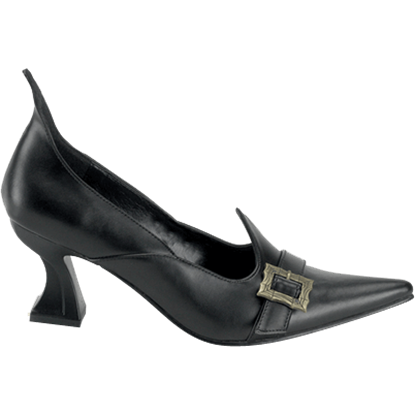 Our Black Magic Witch Shoes are straight out of the story book! These ladies Gothic shoes feature a sculpted heel, a pointed toe, and are finished off with a brass spiderweb buckle for the classic Witch look. The Black Widow Gothic Boots feature a chunky platform heel. Sheer black lace over a solid red inset on each side is accented with corset-style ribbon lacing. These platform boots are perfect for stepping out on the town.